Publisher's Synopsis: "Brendan, Eleanor, and Cordelia Walker once had everything: two loving parents, a beautiful house in San Francisco, and all the portable electronic devices they could want. But everything changed when Dr. Walker lost his job in the wake of a mysterious incident. Now in dire straits, the family must relocate to an old Victorian house that used to be the home of occult novelist Denver Kristoff—a house that feels simultaneously creepy and too good to be true. By the time the Walkers realize that one of their neighbors has sinister plans for them, they're banished to a primeval forest way off the grid. Their parents? Gone. Their friends? A world away. And they aren't alone. Bloodthirsty medieval warriors patrol the woods around them, supernatural pirates roam the neighboring seas, and a power-hungry queen rules the land. To survive, the siblings will have to be braver than they ever thought possible—and fight against their darkest impulses. The key may lie in their own connection to the secret Kristoff legacy. But as they unravel that legacy, they'll discover it's not just their family that's in danger . . . it's the entire world." My Thoughts: My last three reviews have been less than glowing. 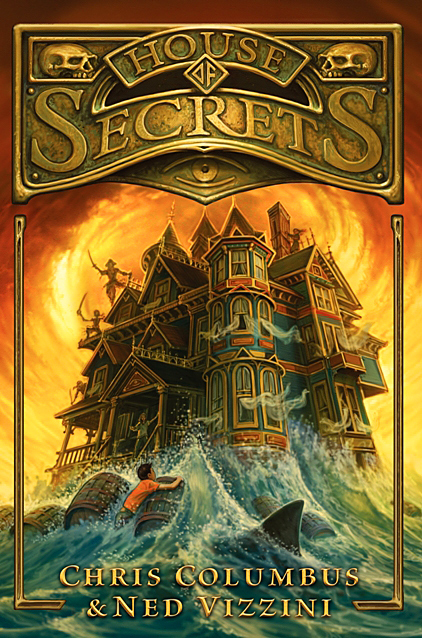 Lately, I have been disappointed by so many promising ones so I really wanted to give House of Secrets a good review. After all, Chris Columbus wrote Goonies. Who doesn't LOVE Goonies? And that's where it all starts to make me go, "Ah, Ha!" My issues with House of Secrets are mostly that it reads like a screenplay. How Ned Vizzini's other books read are a mystery to me. I have to honestly say that I haven't read them. But this one? It's all action and no development. The fast pace may play well into the hands of fidgety middle schoolers, but it does so by creating a fragmented and underdeveloped plot. Things just move too swiftly. The thing I was most annoyed with was the lack of caring on the part of the three protagonist siblings. Mom & Dad might be dead, but they are off on the big adventure without an eye blink. I get it: standard children's lit. formula = get rid of the parents. However, they JUST might have died. Even though the siblings have to go into survival mode with the advancing doom, wouldn't they even pause at some point? Yeah, yeah, we all know the parents will emerge at the end, but this sort of nonexistent character development is exactly why this book is a screenplay disguising itself as a story. Here is a Q & A with the authors on USA Today, along with a video trailer/interview. After I watched it, I felt even more disappointed that House of Secrets didn't have the intended effect on me. What a cool idea the author's had... sort of like a Pagemaster theme (loved that movie too!) I know J.K. Rowling must be friends with Columbus, offering him a nice blurb for his cover, but I can't even put House of Secrets in the same sentence as (insert The-Book-Who-Must-Not-Be-Named here). Recommended for kids who like adventure, fast-paced writing and books that read like a movie. Library purchase worthy (especially since the certain to be a movie and sequels will entice). Not a quality classroom purchase. Believability: Execution as a movie might work better than children's "literature"
Well, rats. I think I would end up having much the same reaction as you! It seems that so much kid lit is just trying to be "a movie" by either writing with the thought that it will one day be one or simply writing in screenplay style.